The conflict between right and left is a big sticking point for shooters, and I’m not talking about politics. I’m talking about hand dominance vs eye dominance. Fear not! 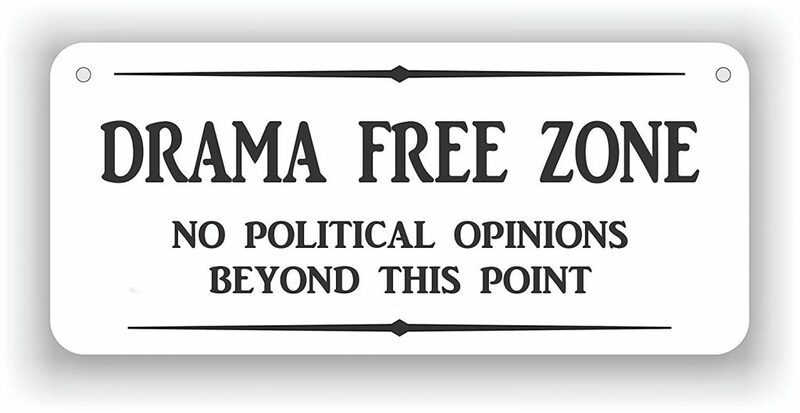 You’ll find no politics here. Unless you’re one of the ridiculously small percentage of people that is truly ambidextrous, your dominant hand is going to have a huge impact on how you shoot. What a lot of people overlook is something even more important: which eye is dominant. Just like your hands, you almost certainly have one eye that is dominant over the other. We don’t have solid numbers but it’s estimated that less than half a percent of the population has no eye dominance either way. Well, if you’re cross-dominant (right eye dominant, but left hand dominant, or vice versa) you can have some trouble shooting if you don’t learn how to correct for it. Roughly a third of the population is thought to be cross-dominant, but thankfully, there are several ways for cross-dominant shooters to shoot just as well as anyone else. The difference comes down to practice and training. As with most issues, the solution is to train more. 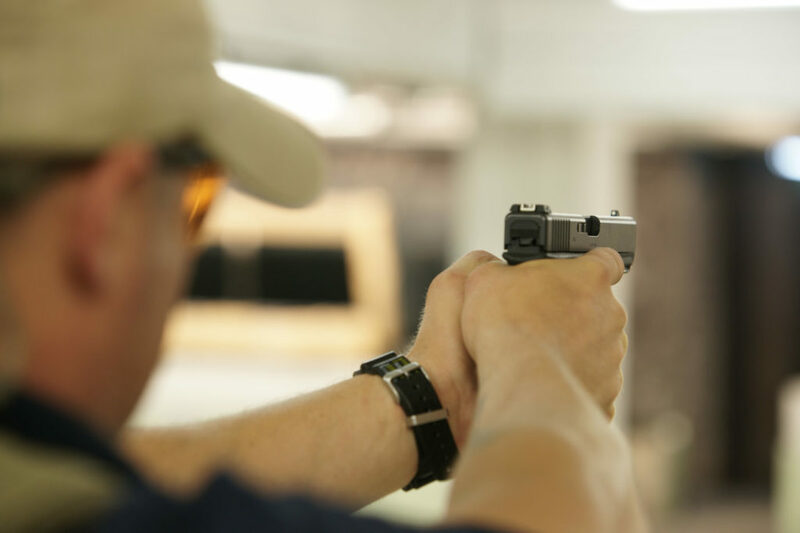 If you think you might be cross-dominant, want to learn how to train someone to overcome cross-dominance, or have a lot of shots that go a little high, but way off to one side (a common indicator that a shooter is cross-dominant) you’re in the right place. Besides misses that land high and to one side, tilting your head to one side, or moving or tilting the gun to your non-dominant side are also signs of cross-dominance, and are things you should be aware of in your own shooting, or in those you’re training. Fortunately, there’s a very easy way to quickly and easily diagnose cross-dominance, and you can try it right now wherever you’re reading this. 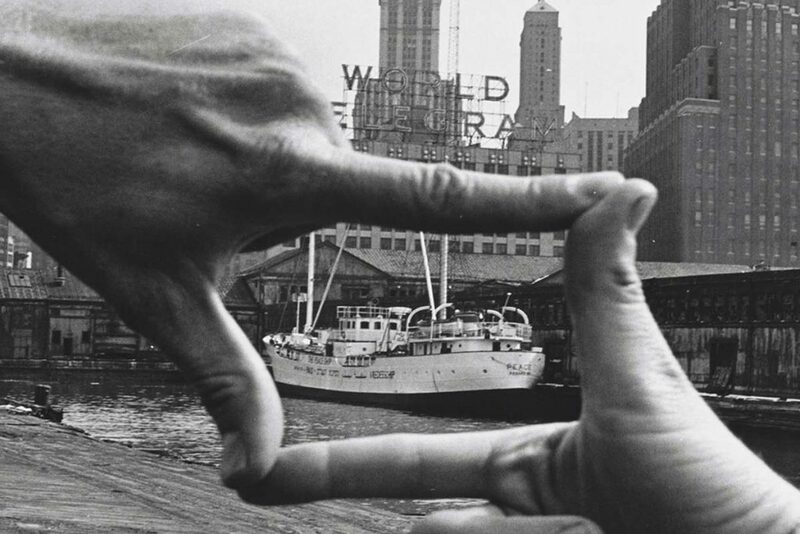 First, hold your hands out in front of you, and make a frame with your fingers like you’re a photographer lining up a shot. Pick something commonly available like a picture on the wall, a piece of furniture, or a 20th century ship in New York Harbor. Find an object a good distance away and tighten the frame you’ve made with your fingers around it, keeping both eyes open. Now, keep your hands still and close one eye, then the other. The object should stay in the frame when viewing it with one eye, and move out of frame when viewing it with the other eye. The eye that keeps the object in the frame and allows you to still see it clearly is your dominant eye. Another way is to extend one arm and point at an object with one finger, keeping both eyes open. Do the same thing as before and close one eye, open it, and close the other eye. Your finger will stay pointed at the object when viewed with your dominant eye, but will appear to move to one side and no longer be pointed at the object when you have your non-dominant eye open. Now, if you are right handed and right eye dominant or left handed and left eye dominant, you’re done unless you’re working with someone who is cross-dominant or you’re a trainer looking for ways to help folks you’re instructing. This is especially important to understand if you’re looking at training your kids early, as they may be cross-dominant whereas you are not. Since you’re still here, let’s take a look at ways to correct for cross-dominance. 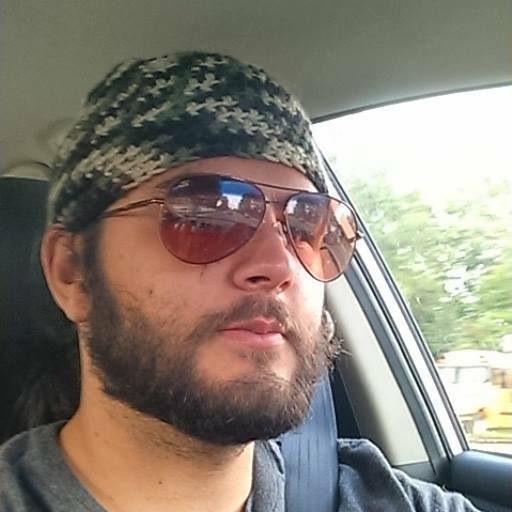 Alright, if you’re looking to overcome cross-dominance when shooting a rifle or shotgun…I have some bad news. Close or occlude vision (by using anything from an eye patch, to translucent tape over your shooting glasses) through one eye. 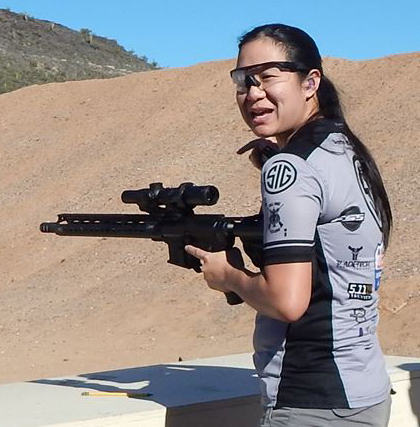 Limiting your peripheral vision, especially in a defensive situation, is never good, but you can get away with it in a match or when at the range. One of our top contributors, Annette Evans demonstrates taping over one side of your eye protection as a cross-dominance fix over at Target Barn. Use a red dot, which will allow you to keep both eyes open, with your dominant eye on the target and your non-dominant eye on the dot. This makes more sense in practice than explaining it, so you’ll just have to try it. You can also do this with other optics, depending on your degree of cross-dominance, but it doesn’t work well with all scopes, and doesn’t work with irons. For what it’s worth, this is what I default to, but I can handle a long gun equally well shooting right or left handed. Like anything else, it’s something you can overcome with training. Learn how to shoot with your non-dominant hand, which is easier with a rifle than a pistol in most cases. 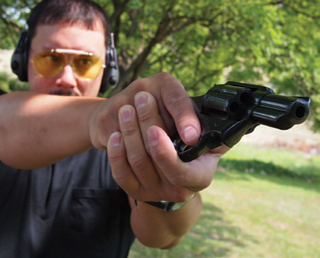 Overcoming cross-dominance with a pistol is a bit easier. 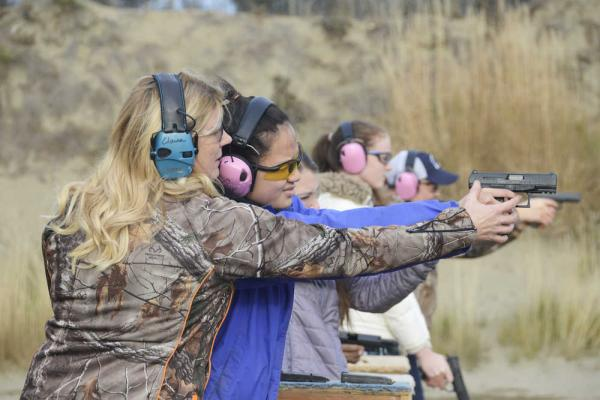 When it comes to pistol shooting, if you’ve never held a gun before, or have limited shooting experience, or are working on training a newbie, I’d strongly recommend teaching them to shoot with the hand that matches their dominant eye, rather than trying to use their non-dominant eye and dominant hand. If you’ve already started shooting and you want to overcome a cross-dominance issue you discovered after, or want to correct issues a student has developed, there are a few things you can do. This a worthwhile skill for anyone to learn, but it is especially important for cross-dominant shooters. Shooting with your non-dominant hand is always good practice. If your dominant hand is injured or otherwise occupied, learning to shoot a handgun with your off-hand can save your life. Beyond that, this is one of the simplest ways to overcome cross-dominance issues, particularly early in your shooting career. Of course, there are problems with this approach. First, you may not be able to get over using your non-dominant hand to shoot. I’ve known many people who were strongly right or left-handed and thus didn’t feel comfortable using their weak hand to control and manipulate a handgun, which is understandable. The other issue is that most handguns are setup for to be shot right-handed only, so shooting left handed can cause a host of problems, particularly with guns that don’t have ambidextrous or swappable controls. In general, I’d say it’s way easier to overcome right eye dominance when you’re left-handed than the other way around. If you’re left-handed, you’re probably already used to conforming to a mostly right-handed world, and you may find it’s easier to do that here. Like with a rifle, you can also close or otherwise block vision through your dominant eye, which will cause your brain to prioritize input from your open, non-dominant eye. For some people, simply squinting one eye (if possible) can work, though it can cause problems with the uneven tension in your face affecting your accuracy. You can also put something like scotch tape, chapstick, or something similar over the lens of your shooting glasses on the side of your dominant eye. Again, I wouldn’t call this eyedeal (heh) but it does work, and many folks find it helpful in competition environments. In a defensive situation, you’re not likely to have your shooting glasses on, and you’re going to want as much of your vision unobscured as possible, so while this works at the range, it isn’t really possible if you’re planning on carrying a handgun for self defense, and if you subscribe to the “train how you plan to fight” mantra like I do, it makes this suggestion impractical at best. Turning your or tilting your head to the side is a totally viable way to bring your dominant eye inline with the sights of your gun, even if it does look a bit silly at the range. The problem here is that it not only feels unnatural, but it’s difficult to maintain and to perform consistently. Neck pain will result if you do this for long periods, and you can develop some long term issues if you do this consistently. For the occasional range trip, it’s fine, and in a panic situation where you need to get your eyes to cooperate right now, it will serve. Jeff Bridges helpfully demonstrating the “tilt your head” approach in the movie True Grit. The other option that I really don’t recommend is canting the gun. Canting the gun 15-45 degrees to the left or right can bring your dominant eye in line with the sights appropriately, but it can also cause a host of other issues and difficulties. First, it’s hard to cant the gun consistently, and when you’re trying to be both fast and accurate, consistency, especially in your training, is key. The second problem is one of function. Modern firearms were designed to be held vertically (not sideways, not canted, not upside down) and any deviation from that can increase the chances of malfunctions, and it also causes problems managing recoil and getting your eyes back on the sights quickly for a follow-up shot. Also, you’re just asking to get hit in the face with brass. Beyond that, you’re going to have some serious trouble adjusting your point-of-aim vs. point-of-impact at longer ranges. This is another technique that I would only advocate using in a pinch, but it can be very effective with a revolver where cycling of brass isn’t as much of an issue. You can also check out another shooter’s approach to cross-dominance with our friends at USCCA. A modern isosceles stance has you holding the gun squarely in the middle of your body. The most natural, and least disruptive method I know of for a cross dominant shooter to address their issue is to simply shift the gun a little to either the left or the right to bring it more in line with your dominant eye. This way, you’re keeping both eyes open, you’re not doing anything weird or uncomfortable with your head, and you’re holding the pistol the way it’s meant to be held. The main problem with this is you have to alter your stance a little regarding how you hold your arms, and it can theoretically make recoil a little more intense because you aren’t in the optimal position to absorb it and compensate. That being said, the difference is relatively minor. The one thing I would be conscious of would be making sure you aren’t pulling shots to your dominant eye side, which is a common issue with this method, in my experience. 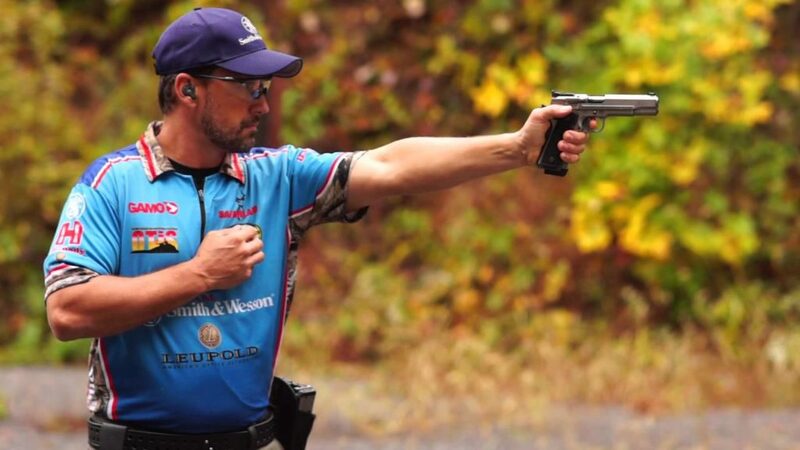 For what it’s worth, this is the method I use, and to my knowledge, is the most common method for professional cross-dominant pistol shooters, and I think that’s because it’s such a natural position. This method is so natural in fact that many cross-dominant shooters arrive at this solution without being told, if they are unaware of their cross-dominance. And if it work, go for it. And that’s something I want to be clear about. All of these solutions can work. You should experiment with them all and find what’s best for you. Just be sure to understand all the potential downsides before you commit to one method, and once you pick something that works, train, train, and train some more. Are you cross-dominant? What do you think of these techniques? Let me know in the comments below. I am 78 yrs old and have been shooting a rifle right handed (very accurately) all my life. Recently I have developed a macular problem in my right eye leaving a small blurry spot right where the cross-hairs cross in the scope while my left eye is still very clear and focused. What can I do with the aid of present day technology to keep from having to learn how to shoot left handed? I’ve been in this “battle” for a couple of years now with teaching my wife basic rifle/handgun shooting and safety. She is strong right hand but left eye dominant and becomes an issue with a rifle. I will try the “tape over glasses” option but has anyone heard of “outlearning” or “retraining” your eye dominance? I’m strongly right hand dominant but also left eye. It was just a matter of practice. Now shooting left handed is just natural and some other things became too. As far as retraining eye dominance I’m not sure. Part of my right eye is black (what I see I mean) so it’s not an option here.